The extensive features offered by network-attached storage (NAS) devices are garnering more interest from consumers, but the difficulty in setting up the devices have kept them out of the mainstream. 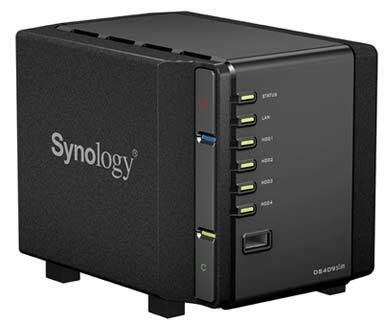 Synology’s Disk Station DS409slim DS409slim is a uniquely-designed NAS device that has four bays for laptop-size hard drives, numerous RAID configurations, multiple features that advanced users will enjoy, and—a welcome improvement over other NAS systems—a simple setup system. The compact, black DS409slim is smaller than your average NAS device, due to the unit’s use of 2.5-inch laptop hard drives as opposed to the bulkier 3.5-inch drives normally associated with NAS units. According to the press materials, the 2.5-inch drives and the Disk Station’s unique design allow it to consume less energy than competing NAS units, thereby reducing your carbon footprint. On the front of the DS409slim, six LED lights denote the status of various features; the bottom four lights indicate the activity of the four hard drives, while the top light denotes the overall unit’s status and the second light shows the LAN’s status. A USB port under the lights provides the ability to augment your storage capacity. On the side of the DS409slim, a blue LED light displays activity for the entire unit. The back of the device has an Ethernet port and the four drive bays for the hard drives. The back also has a USB and eSATA port for expanding your storage capacity or for backing up the DS409slim with an external hard drive. Setting up the Synology Disk Station via Ethernet to our local network was pretty straightforward. Detecting the unit through Bonjour was a cinch and setting up user accounts and accessing the Disk Station Manager Web tool was easy. Unfortunately, the drive’s volumes did not mount on our Mac’s desktop immediately, and there is no stand-alone application to adjust the DS409slim’s settings directly. Everything must be accessed through the browser-based Disk Station Manager program. In order to mount the drive’s volumes, you’ll need to connect to the server directly. Before using the hardware tool, I went to Synology’s Web site to download a firmware update. While it only took a few minutes to download, I realized that most users would not know to take this step as its not indicated anywhere on the interface that the unit would need an update. After logging in, you’ll be confronted with several colorful logos. The most important two are the Management and File Station icons. Management guides you through the nuts and bolts tools of the program, allowing you to access the DS409slim’s three functions: Web Station, Photo Station, and File Station. Once configured, the File Station is perhaps the most commonly used mode of the Disk Station. The late 1990s Windows-styled interface displays the various folders you have access to and lets you copy, delete, and upload files to them. The major oversight with the File Station 2 tool (an application that’s part of Disk Station)—and indeed the current version of the Disk Station itself—is that you cannot upload folders in any capacity, only individual files (up to 100 at a time). According to Synology, the next version of the File Station app, due next year, might possibly have ability to upload folders, but the current version does not. This means every song you upload to the iTunes server, every photo you grab for the Photo Station, every document you want to share must be sifted through and individually selected. This is inconvenient on paper, and bordering on maddening in practice. It took the Disk Station about 24 seconds to upload a single 150MB file, so if you want to share thousands of songs with your network, it could take hours to individually upload every MP3. This oversight is a real shame because the Synology Disk Station software has some compelling features. The initial screen is daunting to begin with, presenting dozens of icons and folders on the lefthand window and then six icons front and center. Every major feature must be configured, which means you’ll be consulting the extensive (but somehow still insufficient) user manual in the installation disc. While companies like HP have made their extensive features easy to learn thanks to well thought out instructional manuals and intuitively-designed setup processes, Synology’s many tools will turn off most consumers due the overwhelming amount of technical information that needs to be sifted through. This is not the NAS unit to cut your teeth on. With the initial six settings icons, you can create a user and manage their privileges, create a shared folder, alter the backup options for the unit, create a website using the web station tool, create an online photo album and blog using the Photo Station icon, and finally setup an FTP server. The Photo Station system in particular I enjoyed. While it was a pain to upload photos individually, once they were on the Disk Station I found it easy to access my photo albums on a generated Website and create a blog. It’s a remarkably family-friendly feature for a unit that is really more marketed to the prosumer crowd. Other tools will let you utilize the Synology Disk Station as a mail server, a surveillance station to view multiple cameras, a Download Station to help organize bit torrent downloads, a DLNA/UPnP media server that will allow you to stream files with a Playstation 3 or Xbox 360, an iTunes server for sharing/streaming music over the network, a USB printer server for sharing a printer over your network, and finally the ability to manipulate the RAID configuration of your choosing. Not only can you set the Disk Station to standard RAID 0, RAID 1, or RAID 5 settings, but also RAID + Spare settings and RAID 6 settings to give you even more redundancy and security. The drives are hot swappable as well, meaning you can immediately pop in a new drive when one has failed. But as previously discussed, the volumes do not initially mount on the desktop or appear in the shared volumes tab of your computer. The Disk Station does have the ability to backup your computer’s hard drive via Time Machine (which can be enabled through the Disk Station’s management tool) and the unit itself can be backed up using an eSATA or USB cord and an additional external drive. The unit retails for $399 without populated drives and $899 with four pre-installed 320GB drives. The 2.5 inch drives are not easy to come by and comparatively pricier than standard 3.5 inch hard drives, making the Disk Station an expensive investment.